Analyzing text organization through the use of mentor texts is a great way to model how authors organize their ideas. 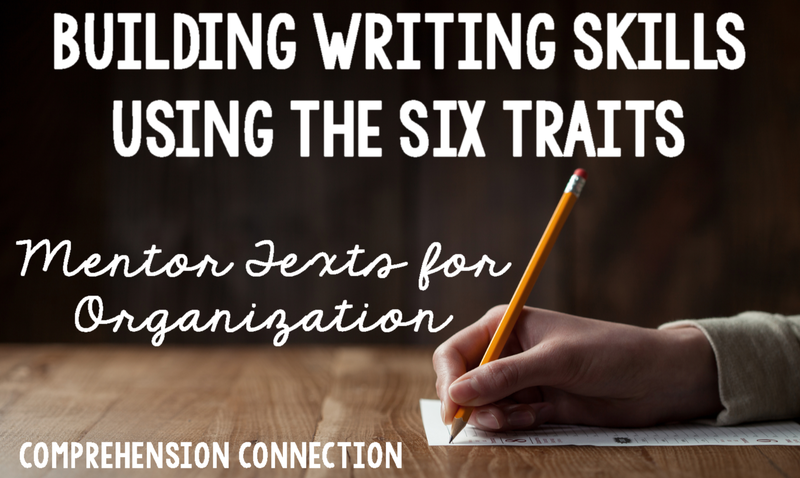 Through careful selection, you can demonstrate the way the students writing should look by looking at what experts do. Studying text structure or patterns you are following in a writing assignment also reinforces patterns and story elements in reading too. 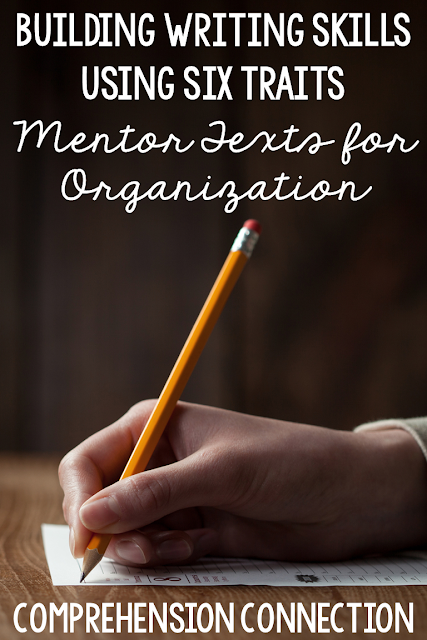 Today in this post, I'll be sharing a collection of mentor texts you can review for working on the trait organization. With each type of writing, we can and should use books that demonstrate the organization of the writing genre. Using quality literature as exemplars gives our kids the road map to creating their own well organized piece. It's like putting together a puzzle. The first text I am sharing is the book, Big Chickens by Leslie Helakoski. I just love the progression of this book. The idea was so clever, and it models story structure well. 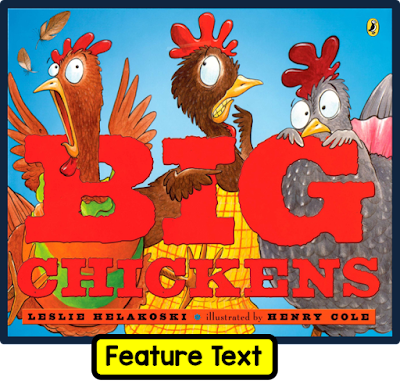 When reading the book to your group, it's fun to change your voice or have the children chime in during the "chorus" part. At the beginning of the book, the wolf comes and scares the chickens out of the hen house, and they are off to face more things that scare them. The story ends with the chickens wandering into a cave followed by the wolf who is scared away by the chickens. I think using an Artist Storyboard would work well for both analyzing this book and planning another. It'd be fun to take the chickens on another adventure or to write from another animal's point of view. 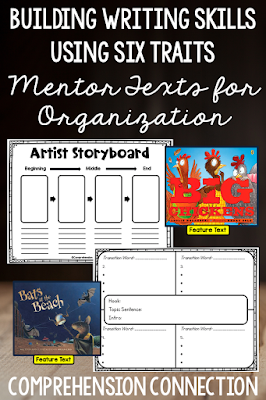 At this end of this post, I'll add a copy of the Artist Storyboard organizer teachers might use. The second book I chose is Bats at the Beach by Brian Lies. I thought this might be a fun one to do at the beginning of the year when some of the children you might be teaching have perhaps traveled to the beach. This is a rhyming book told in chronological order. The setting is at night, so you might start a discussion about the importance of the setting and why this story can't take place during the day. Even though the level of this book is probably between 2nd and 3rd, I think writing a rhyming book would be too hard for this age, but I think upper elementary would enjoy it. I would probably do this writing assignment in pairs. I think it'd be fun to write...Bats Go to School, Bats at My House, or Bats at the Zoo. Planning for this story might be best using the Four Square model. 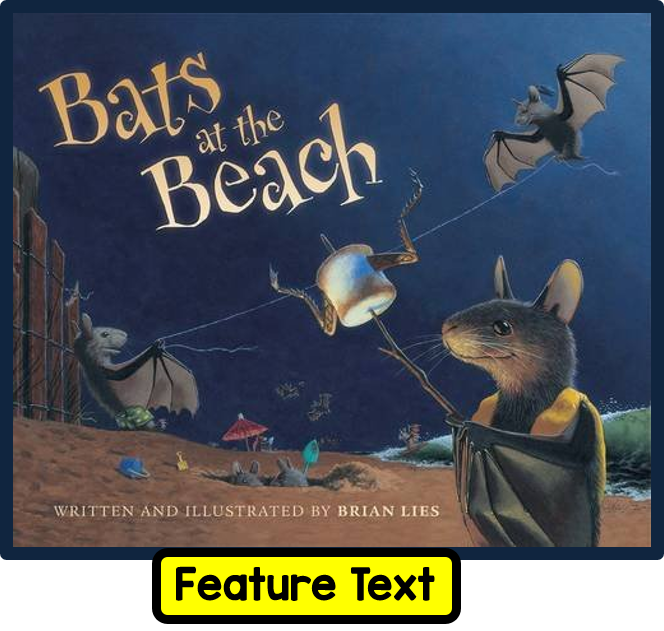 I think it would give the students a basic frame to follow, and a place to select their word choice if they want to follow the rhyming pattern of Bats at the Beach. At the bottom of this post, I will share the form I used with my students last year. If you need an explanation of how the Four Square model works, you can access THIS POST for more information. Interested in getting tips, resource information, and subscriber exclusive resources? Click here to sign up. You'll receive a Mitten Shape Book that you can use for making a book review wall as well as the password for my VIP library. You are sharing some great information here! I will be checking out these websites that you mentioned. I am always looking for new writing lessons!